I must admit that I've become more "squash adventurous" since moving up north. There are so many varieties to try! This year, it's been "The Year of the Spaghetti Squash" and I just can't seem to get enough. 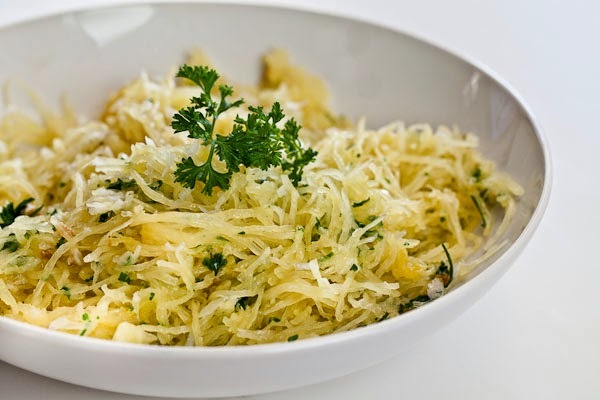 The texture of spaghetti squash really isn't at all like spaghetti per say, but more like grated, cooked squash. Imagine if you took a butternut squash and grated it fine, then cooked it...that's more the texture. It still has a little veggie crunch to it, and I guess it looks like spaghetti, but believe me, that's as far as it gets to the famous carbohydrate. Anyway, it was always a mystery to me of what to do with it and fortunately I have found a technique and recipe that I have made no less than 5 or 6 times in the past couple of weeks. Super easy and super yummy! The primary cooking method I use is with my Crock Pot, which really is no more than plopping the squash in, adding water, and turning on the heat. This is so hands-off, that you can't help but love it! First, I take my spaghetti squash and give it a good rinse/wash with plain water to remove exterior grime. 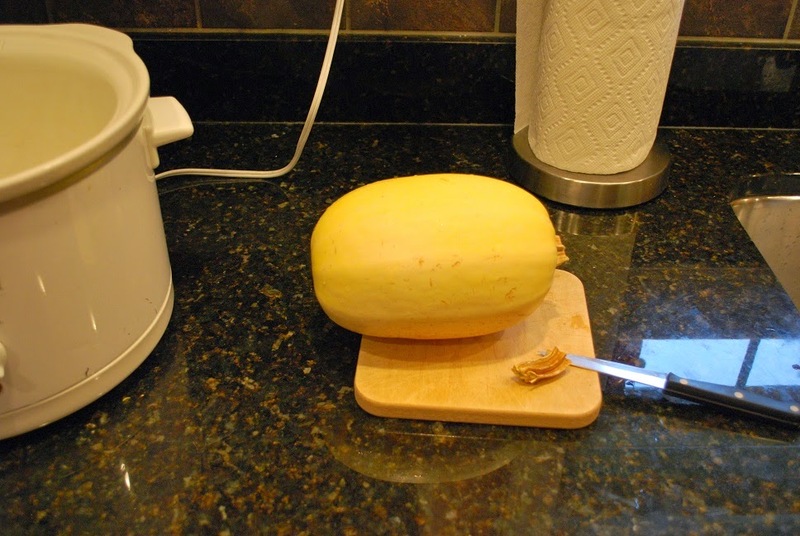 I then cut off the stem so the spaghetti squash will fit in my Crock Pot. 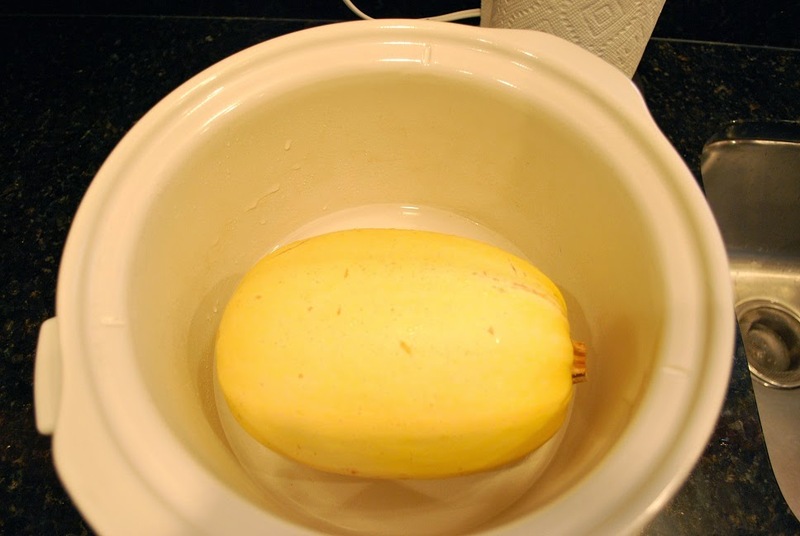 I then plop the whole squash in my Crock Pot and add about 1-2 cups water. Put on the lid, set the heat to Low, and let it cook for about 6-7 hours. 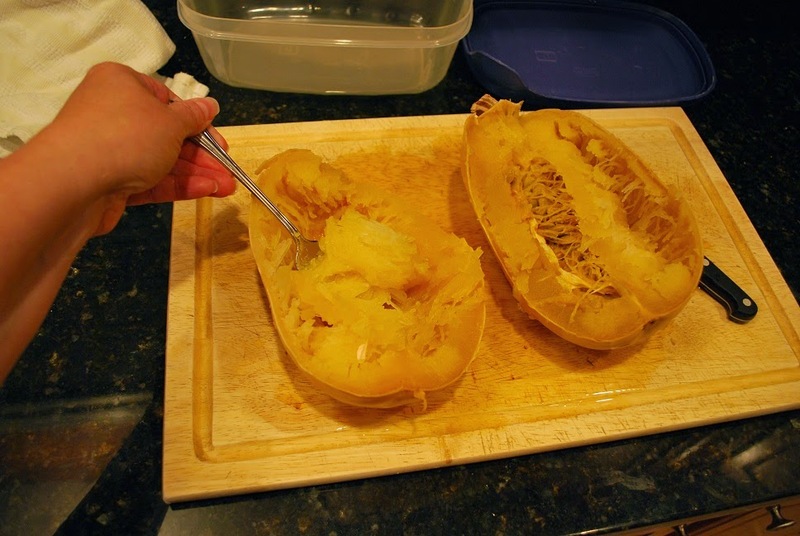 After the squash is cooked, I remove it from the Crock Pot, cut the squash in half, remove the seeds, and then scoop out the flesh with a fork. Now, we're ready for some business! You could, of course, eat the squash just the way it is now with a little salt and pepper, but I found a WONDERFUL recipe that calls for sauteing the cooked squash with a litttle butter, garlic, fresh parsley, and salt and pepper. Sublime! It gets better the next day and it is the perfect side dish. I found my recipe at Steamy Kitchen. Doesn't this look divine? It is, trust me!